John Howarth is MEP for South East England. He has been involved in politics for 45 years. His activities in the European Parliament are set out here. Before being returned to the Parliament, John spent nearly 30 years in senior business management. He worked in the technology sector as a partner and board level director. He worked in a company developing health, software connectivity software and business data repository applications and providing services. He founded and operated a communications agency developing brands and strategies for corporate, public sector and political clients. John also spent three years as a consultant for international business communications and public affairs company, Instinctif Partners. He was a qualified member of the Chartered Society of Designers and has written technology and political blogs and columns for newspapers and magazines on current affairs, film and food. John says, "Nobody in my family had ever been in business - they worked in holes in the ground, digging holes and on farms. I knew nothing about business but I knew I wanted to have a go at it. I earned money running a DJ business when I was still studying at school. Sometimes I wonder what might have happened if I had stuck with it. I loved doing it and it gave me the taste for selling what I did". In public life John served on Unitary and County Councils and as a member of the South East England Assembly. He was a member of the Council of the University of Reading and a Trustee of a number of charities. On Berkshire County Council he was Chair of Transport and spokesman on Environment. He helped quash plans to build 6,000 houses on the Kennet Valley flood plain, kill off damaging road proposals while prioritising the building of the Reading A33 relief road. John won the co-operation of the Council for the construction of Reading FC’s Madejski Stadium and prevented destructive gravel extraction in Slough. John helped establish the Thames Valley European Forum and successfully argued for the abolition of the Council and Berkshire’s replacement with unitary local government. Following his election to Reading’s Unitary Council John again took responsibility for Transport. He led the Council to achieve the highest funding per-capita of any UK Transport Authority and led the successful major scheme bid for the reconstruction of M4 Junction 11 and the building of associate Park and Ride facilities. Resisting calls for privatisation, John instead delivered the re-structuring of the board and senior leadership of municipal transport company, Reading Buses. He delivered a major investment programme to modernise and re-brand the business, bringing in broader commercial expertise that transformed into a successful public enterprise. 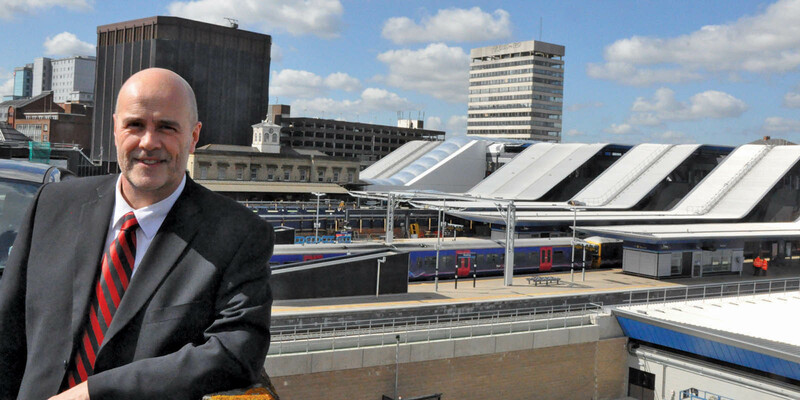 He committed the Council, at the time of the collapse of the privatised Railtrack, to champion the Reading Station capacity expansion on the Great Western mainline. With John as Chair of the Project Board, the proposal won financial support through the EU TENs (Trans-European networks) programme, from the South East, South West and Welsh Assemblies and ultimately the UK Government committing £790m to works on the track and to rebuild the station itself. John also led for the Council on strategic planning, approving partnerships for urban regeneration projects in central and south Reading and increasing the requirement for social housing as a proportion of residential planning permissions. As a Member of the South East Regional Assembly and the Government’s Regional Transport Board, John helped win the support of the Board for projects benefiting Brighton, Portsmouth and the A3 corridor. He was a member of the Berkshire Joint Strategic Planning Committee and the Thames Valley Safer Roads Partnership. John became involved with the Labour Party during the first of the UK General Elections of 1974. He says, "My Dad was on strike and I wanted Ted Heath out and my Dad back to work with a pay rise. It was simple - Labour was always our party". After serving National Secretary of Labour Students, helping oust the Communist Party from control of the National Union of Students, he became a full-time organiser for Labour and then a regional organiser for Labour in the South East. After moving from the Labour Party staff to work in the private sector, John became the Chair of Reading Labour for five years and was responsible for press, campaigns and communications for the following decade. He also server as an officer of Berkshire and Hampshire County Labour parties, the Thames Valley European Constituency organisation and has been a member of Labour's South East Regional Executive and the National Policy Forum. John is a member of the National Union of Journalists of UK and Ireland and was formerly a member of the Transport and General Workers' Union. Born into a mining family on Tyneside, John attended the local comprehensive school and became the first of the family to go into higher education. He graduated from the University of Essex in Economics and went on to gain a Master’s in Art History and Theory studying cinema and visual media. John describes this as “a seemingly bizarre combination that was actually the perfect grounding for a career in brand and advertising”. John is married to Jane Coney, a Designer. He has two grown up children, Jamie – an Engineer, and Jess – a Visual Merchandising Designer, and a step daughter, Alex, who is studying Fashion Communication and Branding. When not working John’s main interests are playing guitar and following Newcastle United. He enjoys art, photography, movies and books, cooking for friends and family and the occasional round of golf - though time doesn't permit much of any of this just now. John says, "Having a hinterland is very important for a politician and if it's the only thing you do you can become very boring. The biggest sacrifice of being an MEP is not being able to play in a band - I miss it massively, one of the best things I've been able to do in life".